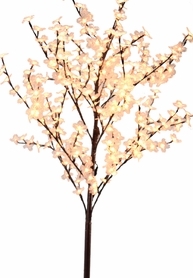 Home > Floral Decor > Trees in Pots & Bases > CLEARANCE! 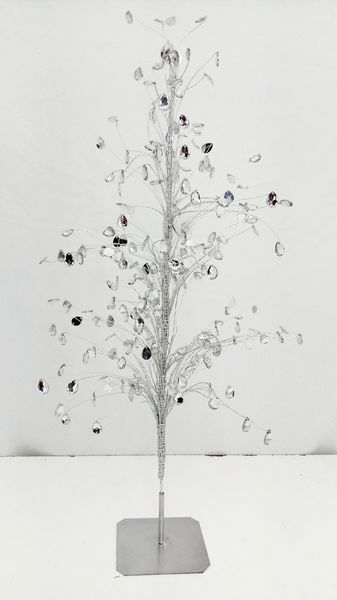 Metallic Silver Beaded Centerpiece Tree "Bridgette" 30"
If you crave the metal industrial look but can't give up glamor and bling, our Metallic Silver Beaded Tree "Bridgette" will satisfy both of your desires! 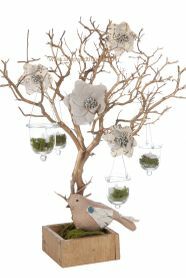 This wonderous centerpiece tree is 30" tall and the bendable stems are made of thin wire twisted together and the stems will hold their position as you shape it. Display the stems upright or spread them out as in the main photo. The approx. spread of the branches is 14" and the base is a 5 1/4" square. Sparkling from top to bottom, this decorative tree is loaded with teardrop shaped beads that are faceted crystal on the front and bright metallic silver on the back, resulting in a mirror-like shine! Another wonderful feature of Bridgette is that the top piece is separate from the base meaning you can insert this shiny tree into a vase or use her to enhance a floral arrangement! There is a 4" pick at the base of the tree with an additional 3" of wire stalk to use as an insert. 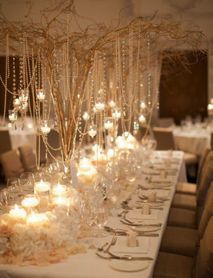 You can also add a strand of fairy string lights to really show off this metallic beauty!